Elizabeth A. Dooley, Ed.D., serves as the University of Central Florida’s provost and vice president for Academic Affairs. 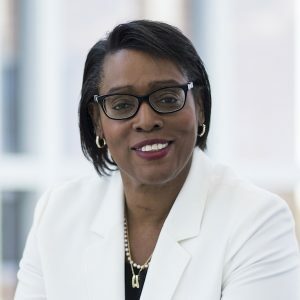 She is UCF’s chief academic officer, providing leadership for 13 colleges, including a college of medicine, along with multiple campuses, research centers, and institutes. Her responsibilities include curriculum, faculty development, academic support services, student services, and oversight of UCF’s $1.8 billion operating budget. Dr. Dooley is a champion of student and faculty success. She collaborates across UCF to foster a culture of teaching and learning that engages faculty and students in creating knowledge, promoting scholarship and developing cutting-edge teaching and learning practices. Before joining UCF in 2015, Dr. Dooley was the associate provost for Undergraduate Academic Affairs at West Virginia University, where her leadership roles also included being the founding dean of the University College and department chair of Curriculum Instruction/Literacy Studies and Special Education. A native of Fairmont, West Virginia, Dr. Dooley holds a doctorate in Education (Special Education with a minor in Higher Education Administration) and a master’s degree in Special Education from WVU. She earned a bachelor’s degree in Elementary Education with a specialization in Special Education from Alderson Broaddus College.